* You can lock in your place now for just a 20% Deposit! To book and see upcoming program dates and pricing information, check out our new booking system and program pages on the World Weavers Website. Engage your mind, body, and spirit in an adventure crafted to promote personal and spiritual development and growth. Cultivate inner calm and a greater sense of wellbeing with an introduction to Vipassana meditation practice. Interact with "Monk-Activists" and be inspired by the way in which monastic communities are working to support improvements in education and the environment. Develop your knowledge and deepen your wisdom though the teachings, practices and philosophies of Theravada Buddhism. Immerse yourself in the vibrant, fascinating culture of Cambodia and explore the complex continuing impact of the Kingdom’s turbulent 20th century. Participate in group discussions and reflections, and expose yourself to new perspectives, challenge opinions, and share new ideas. 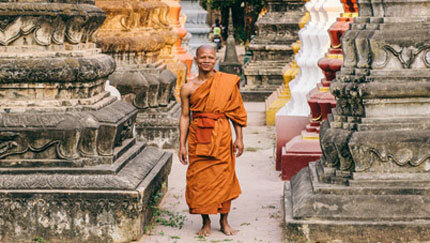 World Weavers in partnership with local responsible tour operator Ayana Journeys is thrilled to bring you Monk for a Month Cambodia – A Journey Through Time. Against a backdrop of verdant rice fields, swaying palm trees, and tinkling pagoda music, we have developed an enriching program for those ready to discover new teachings, stretch preconceptions, explore spiritual practices, and indeed 'empty their cup'. 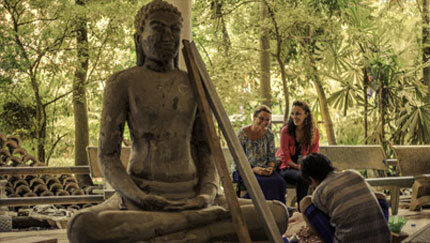 Monk for a Month Cambodia is a learning journey in every sense – academic, spiritual, and physical. This journey is carefully crafted to assist participants in expanding their understanding of Theravada Buddhism in a uniquely Cambodian context, and reflecting on what impact this may have on our own faith and/or spirituality. We will learn to chant the sutras in Pali, meet monk-activists dedicated to supporting their communities, and delve into the intricately interlaced philosophies of Buddhism, Hinduism, and Animism in Cambodia. Throughout the entire adventure participants will be accompanied by Yut, a former monk of 16 years and experienced tourism professional. 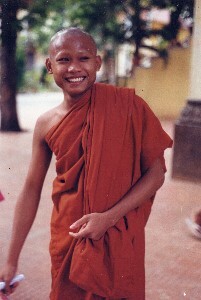 Yut ordained as a monk at the age of 9 and spent his formative years studying the Dhama first in Cambodia, and then at the Buddhist University of Chiang Mai (Thailand). He is a passionate ambassador for his country, and is has long been his desire to share Khmer Buddhism with curious travellers. As a former monk, Yut will act as a guide both logistically and spiritually. He will be able to offer a great deal of insight into Theravada Buddhist teachings, and their intersection with Cambodian culture (both currently and historically). Yut is also able to lead introductory meditation sessions, teach basic “soat-moan” (chanting the Sutras), and translate discussions with monks, holy men and women, and local people along the way. Yut works primarily in educational tourism and is an experienced facilitator, so will be able to support participants in their exploration of Buddhist teachings and Cambodian culture. All prices are USD and based on twin/share accommodation, Prices exclude international airfares. Secure your place with a 20% Deposit on Checkout, only $476USD! Travel insurance, accident or health emergency, evacuation, loss, theft or damage to baggage and personal effects. Flights to and from Cambodia. Any kind of alcoholic drinks, hot water, cold drinks, laundry, phone call and internet.